The majority of Canadians (57%) would love to see Verizon and other US mobile carriers entering the local mobile market. Also, Canadians believe that allowing Verizon or any other US carrier to operate here, would lead to lower rates (68%), but still, two-thirds (65%) agree Verizon should not be favoured in the forthcoming wireless spectrum auction, a recently published Forum Research poll reads, as cited by the Globe and Mail. This is the second scientific report the incumbents like to cite. The first one, commissioned by Bell and Telus, found that 61% of Canadians say Verizon should not be favoured. With the second, the Forum Research study, this number reached 66%. “Canadians favour some outside competition in the mobile communications market. As long as new entrants are required to compete on a level playing field with Canadian carriers, Canadians see only upside in Verizon offering their services here,” said Forum Research President, Dr. Lorne Bozinoff. Since there were discrepancies between the study commissioned by the incumbents and another unscientific one found on the Star’s website, we have decided to conduct our own, unscientific survey. 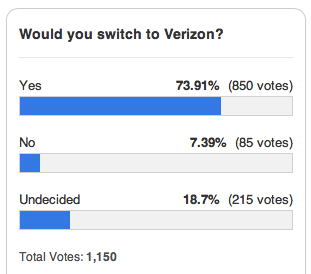 And the results speak for themselves: the vast majority of those who answered our poll would switch to Verizon. Here are the findings: 74% would switch to Verizon; 29% of the voters would favour the red US carrier in the upcoming wireless spectrum auction, while another 32% believe newer entrants (such as Mobilicity, WIND, etc.) should be favoured. 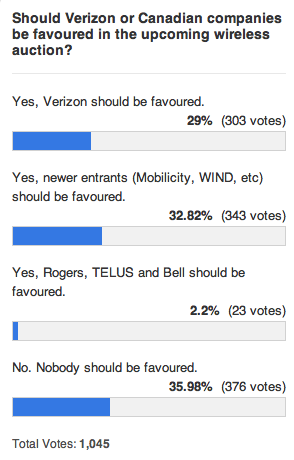 Only a small percentage of our readers would favour Rogers, Telus, and Bell: 2%. Of the 1045 voters, 36% (376) believe nobody should be favoured. Our results stand in contrast to the Forum Research survey, which claims 65% of Canadians say they didn’t think any foreign company should be given preferential access to the spectrum.